perpetuate the memory of the heroes who had captured the British Crown Colony. His Tower of Triumph was to stand 480 metres high and be visible from every corner of Hong Kong. To celebrate December 8, 1942, the first anniversary of Japan’s attack on Hong Kong, General Isogai drove to Mount Cameron. He was to witness the ceremonial installation of a sword in the Memorial’s foundation. The famous sword expert Kurihara had received the sacred weapon from the hands of Emperor Hirohito. Following the sword ceremony Isogai laid the foundation stone. Then, using forced labour, they started work on the foundation. Granite for facing the tower came from quarries in the Happy Valley area behind the cemetery. Workmen faced these granite blocks on the sporting grounds of Craigengower and the Police Recreation Club. It was a Sunday custom for the Japanese to make a pilgrimage to the shrine, each carrying a stone to help in its erection. To celebrate the surrender of the Colony the Japanese screened Victory in Hong Kong. A vestibule card showed Oscars dog-fighting with doomed British planes trailing smoke. It was exciting but illusory, for the Royal Air Force never got into the air. The film screened on December 25, 1942, and the venue that preached this claptrap to the faithful was the old Queen’s Theatre on the corner of Queen’s Road and D’Aguilar Street. Several prominent turncoats, occupying the best seats, joined in the banzais on queue. The Hong Kong Chinese population merely ignored this propaganda-padded garbage. 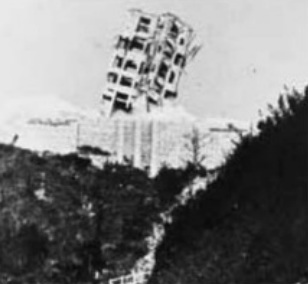 In July 1945, Tokyo ordered work stopped on the Memorial on Mount Cameron. 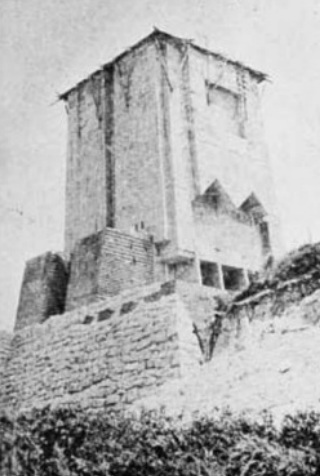 A makeshift roof topped a mere 80 feet of pylon. 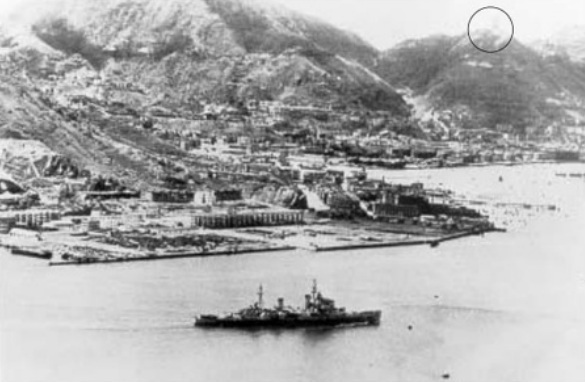 The Japanese surrendered Hong Kong to Sir Cecil Harcourt on 15 September 1945. 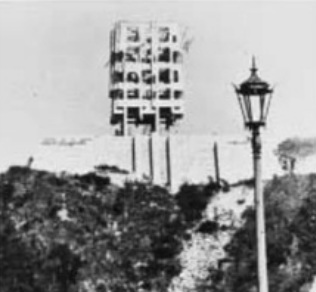 February 26, 1947, was the day the Mount Cameron monstrosity disappeared from the Hong Kong panorama. The Wah Hing Construction Company, the felling contractors, had removed eight of the Monument’s 12 legs. They weakened the remaining four legs by acetylene torches and packed them with explosive charges to be fired electrically. Mr H. W. Forsyth, the PWD engineer in charge, saw Governor Sir Mark Young accompanied by his family arrive on the site. I recalled that Sir Mark’s treatment in Japanese hands was harsh and here he stood about to see his tormentors humbled – I wondered what were his thoughts? Forsyth’s signal started a worker pounding a gong for three minutes. An explosion caused a vast cloud of chalky dust to billow into the sky – it was four in the afternoon. A breeze cleared the air, and with other onlookers I cheered unashamedly as that symbol of the “monkey-men” disappeared and our navigational check-point with it. The demolisher did not expunge every visible memory of that monstrosity. The foundation now supports apartments. I wonder how many residents realise this – it is rumoured that the sacred sword still remains in the bowels of the foundation!